Photo: Via Pew Research Center/Slate. Burkas, hijabs, niqabs — these conservative garments all come to mind when Westerners think of how Muslim women dress. However, the new Middle Eastern Values Survey conducted by the University of Michigan's Institute for Social Research shows that it's impossible to paint each country in the area with the same brush. 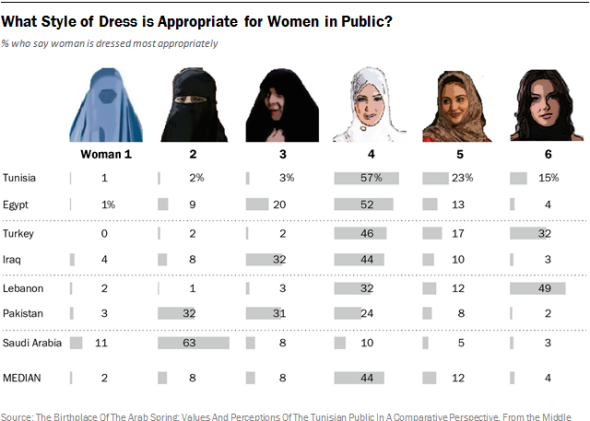 And, thanks to this handy chart created by the Pew Research Center, we can see just how Muslim countries differ when it comes to attitudes about how women should dress. According to the survey, in which several hundred "nationally representative" citizens from seven Islamic nations were polled, Saudi Arabia takes the most conservative stance. Some 11% of Saudis saw the face-obscuring burka as the most appropriate form of female dress, compared to single digits in neighboring countries, while 63% favor the niqab, a veil that exposes only a female's eyes. Overall, a fitted hijab, which covers a woman's hair, was deemed the most acceptable fashion fixture in each country, earning 44% of the vote on average. While Lebanon, Turkey, and Tunisia showed support for covering the hair, those countries also had the most liberal attitudes. The majority of Lebanese polled (56%) said women should be allowed to dress freely, compared to just 14% of Egyptians.